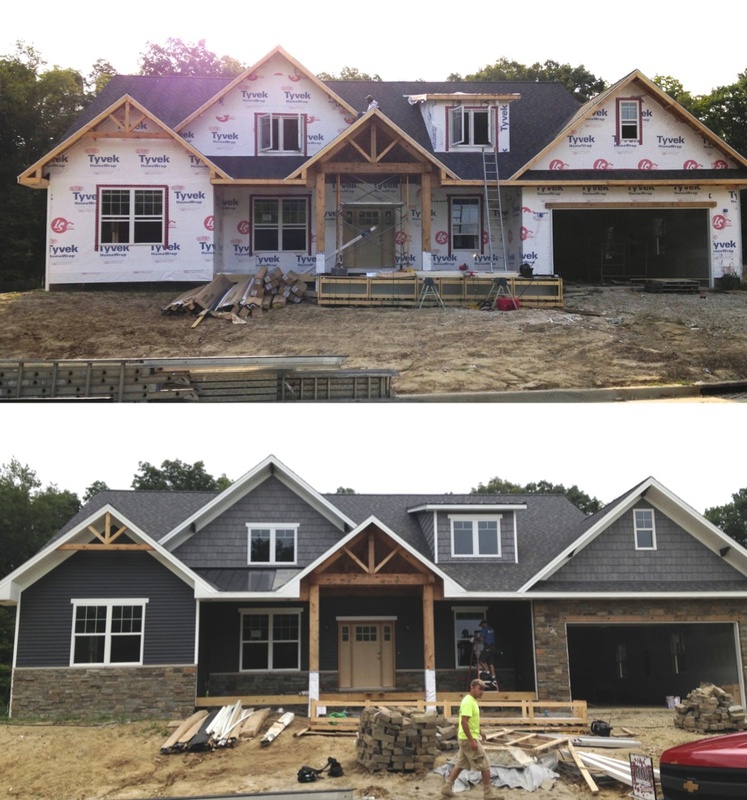 building own home – Carlson Exteriors Inc.
Making color selections can be very difficult and stressful for first time home builders; but it doesn’t have to be! Here are a few easy steps to get you started in knowing what you want, but just as important, what you don’t want. Subdivisions are a great place to get color selections. Your local neighborhoods are great resources to find combinations that you like. We usually suggest newer neighborhoods because are more likely to be up to date on all product styles and color offerings. Take photos and record address of homes that strike your fancy. These are great to share with your contractor. These two platforms are chalk full of photos. You will definitely find a wide array of styles, colors, and combinations. This is perfect to do when you have a few extra minutes or want to look late or night. The one downside to looking on Pinterest or Instagram is that not all products you see are guaranteed to be provided in your area or by your contractor. Your contractor should have tons of photos readily available to you on their website. 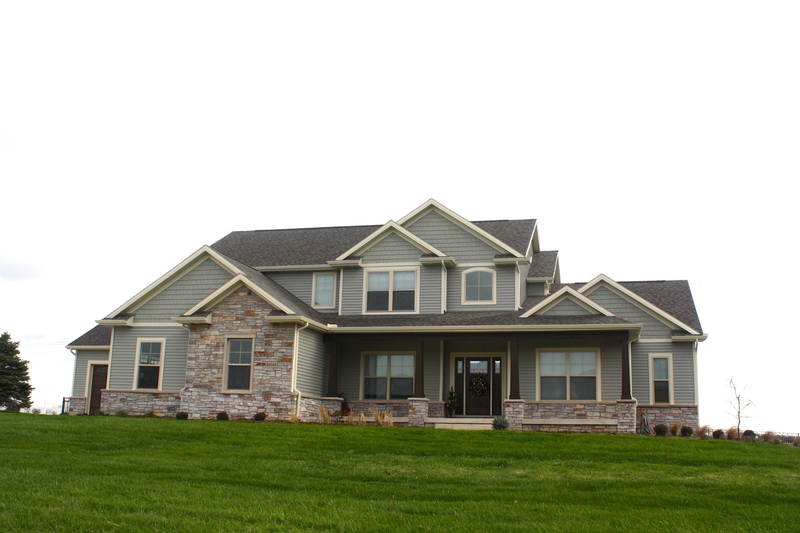 We love asking clients to start here because we know exactly what products/colors are installed on each home. Often times customers want to know what’s available in their budget or get a little reassurance from a professional. Meeting with your contractor lays a great foundation. They can even go through their online photos with you to help you visualize. 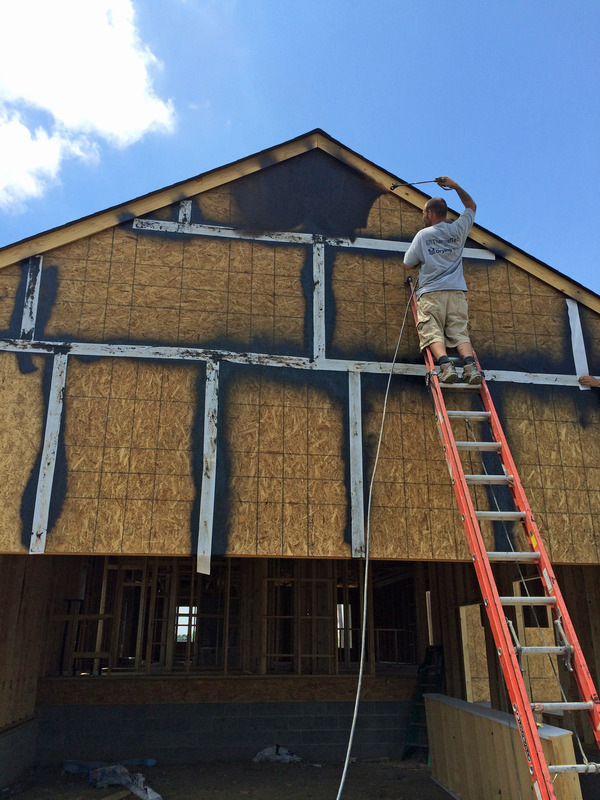 You may or may not have noticed a few new construction homes in your city that get this black coating instead of any house wrap paper products. The black coating is an exciting, newer product called EnviroDri; we believe EnviroDri is more efficient in function and cost savings than any other type of house wrap. This product streamlines the construction process and eliminates any worry a potential homeowner might have about any leaks or energy efficiency. Homes need to have some sort of water resistive barrier over the sheeting to prevent water from entering the house from the outside but breathable for moisture to escape from the inside of the home. Typically, house wrap was been used as this water-resistive barrier; it is taped onto the home in large paper sheets. Any place the house sheeting meets another piece of sheeting the seam should be taped then the wrapping should be layered to provide protection as the house settles with age. Since the wrapping is put up in large sections, it’s common practice to add staples through each section to prevent the wind catching the paper and ripping it before the siding can be installed over it. As you can imagine already there are a few possibilities where this form of house wrap can fail. Any place the paper has been mechanically fastened (stapled) on to the home is at risk for a leak since the barrier has been penetrated. This is a very low risk, but, still a possibility. 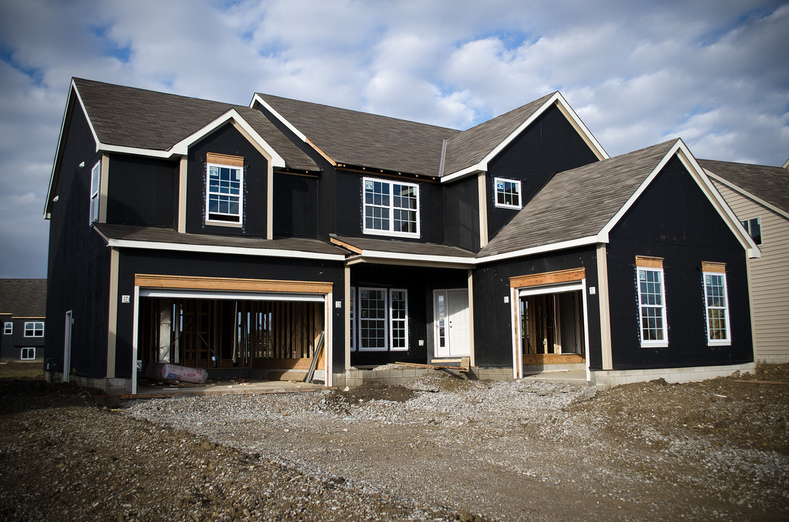 Depending on how fast your home is built, there could be a good span of time where your house sits with only house wrap on it while it waits for the siding or brick install; strong winds or storms can pull this house wrapping off or tamper the seals if not installed properly. While it is in the manufacturer’s installation instructions to overlap over sheeting seams, the installer might not follow this in efforts to cut their own material costs. Let’s say everything was installed properly and you been living in your home for a few years without any leaks or problems but a storm comes and blows off some siding. Your house wrap in that section is now exposed and if the storms or strong winds continue, the house wrap could become shredded in the exposure. EnviroDri is a water resistant membrane that is sprayed onto your home after it’s been sheeted. The membrane and the wooden underlayment function as one unit once the membrane is cured. All seams have a water resistive “mesh” applied over and then sprayed again by the EnviroDri membrane. The mesh flexes with the seams the house settles, effectively protecting it throughout the shifting. Since EnviroDri is sprayed on there won’t be any mechanical fasteners piercing the barrier, so absolutely no risk of leaks due to that. Since the membrane is adhered to the sheeting, if your siding blows off your house is still protected from any storms or high winds. EnviroDri is more energy efficient than any other form of house wrap. It’s more efficient because it’s a tighter protection than any form of house wrap because there is no space between the sheeting and the barrier. This allows you to go from a a 2×6 wall with R-19 insulation to a 2×4 wall with a R-13 insulation and still see energy improvements. 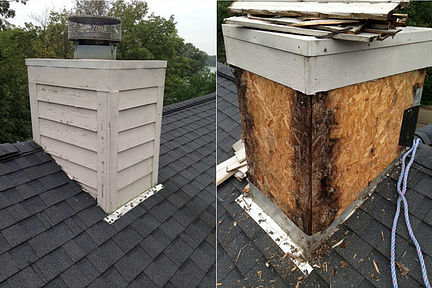 The attic insulation can also go from a R-50 to an R-30. All of this saves money on materials and energy in the long run. Why wouldn’t you want your house EnviroDri’d? Quick recap, you’ve weighed the pros and cons and chose to be your own General Contractor (GC); you’ve also jumped the initial insurance and bank hurdles. Now it’s time to find contractors to give you estimates. As a general rule of thumb 3-5 estimates are a good comparison. Start with 3 and if you have one estimate that is drastically different (low or high) get another estimate; or if one contractor you met with made you feel uncomfortable, get another estimate. The goal is to feel confident in the contractor and their crew’s ability to do quality work. When picking subcontractors, look for companies that can offer full service within their interior or exterior fields. The more they can do the less contractors you have to coordinate schedules through. For example, if you find a roofing company that also offers siding and gutters, get estimates for all three. If you go with a multi-service company, they will schedule the workers accordingly and if any delays arise they already know and will accommodate, again, less work for you as the GC. Look for companies with a reputable background, local office, have longevity, and have all the necessary licenses per state requirements. A good place to start is to call around to builders and ask for recommendations or who does their work. Many homeowners think they can shop around and purchase materials cheaper than the contractors. However, this is rarely the case, and if it is the case, you might be looking at lower quality materials. The reason? Many contractors have a standing relationship with their supplier and get discounted rates based on the annual volume of materials that contractor buys from that supplier. Contractors often purchase their materials in bulk, which results in a discount. If you decide you still want to purchase the materials yourself, you are in charge of determining the amount of materials and what materials for the job. If the contractor installing the work is NOT providing the material, they will not spend the extra time coming up with a material list for you (unless otherwise compensated). If any additional material is needed while installing, whoever purchased the materials is required to supplement. If the contractor supplies the material, they can arrange for the supplier to send the needed material quicker than calling you, the GC, to get it. If you do decide to still purchase the materials yourself, shop a few different suppliers and make sure the quality of products are equal. Typically, the builder or GC is in charge of getting all the necessary permits for each step. It may raise your estimate a bit, but specifically ask that each contractor get the permits themselves. Why? For a few reasons: A homeowner can pull any building permits for their own property without having any state required licenses. If the contractor pulls the permit, this ensures that they have all the proper licenses and insurance, because they cannot obtain the permit with out it. Contractors are also more familiar with the permit process and won’t get hung up by overlooking details. When commencing work, it’s a good idea to have your contractors sign a document that says something similar to the following even if they are properly insured and covered with workers compensation. This basically covers you from any fines or responsibility if OSHA gets involved with an accident or procedures not properly followed. Lastly, whether you decided to do it yourself or go through a general contractor, enjoy it! You are building your home and it’s an exciting step in your life. So you’ve decided you want to be your own General Contractor…Congratulations! It was a tough decision to make and the path won’t always be the easiest to take. As the previous blog stated, you don’t have to be construction savvy to feel capable of being a General Contractor (GC) but it is good to have someone you can turn to for advice or tips along the way. If this is your first time being GC, be weary of not exhausting your support person- ideally you’d like to stay friends with them after your home has been built. In the meantime, this blog will attempt to give you a good foundation in beginning your adventure as GC. First off, if you are married or are with someone,, make sure you both are 100% on board for building your own home as your own General Contractor; this has been known to put quite a strain on relationships. Be comfortable with and be prepared to assume the risks of being your own General Contractor. 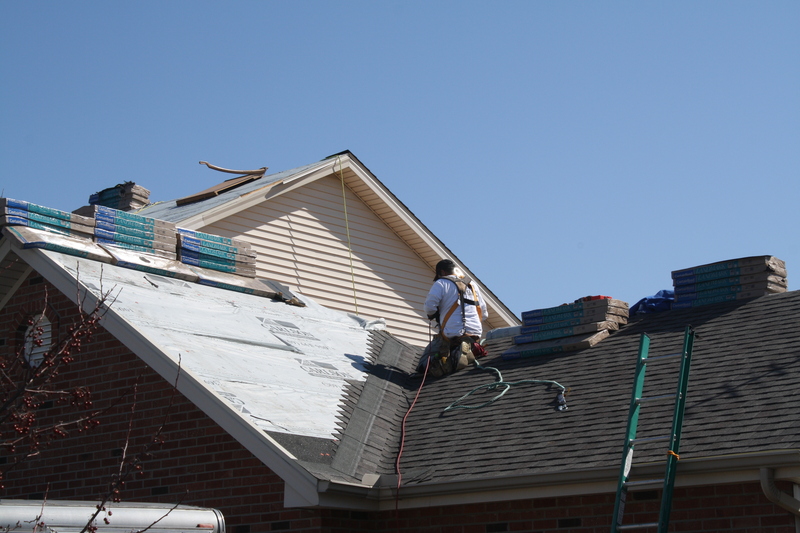 For homeowners being their own GC, make sure the contractors are insured and have Workers Compensation insurance. Homeowner’s General Liability insurance will not cover any injuries/accidents to workers on your jobsite- General Liability only protects your physical property. If you have uninsured contractors working for you and they get seriously injured, lawyers will find the homeowner as financially responsible for medical bills, income loss, and whatever else they can think of. If you are being your own GC, it’s safer to eliminate any uninsured contractors from your list- as a bonus; insured contractors usually have a higher quality in their craftsmanship. Banks are usually more leery of giving construction loans to homeowners building their own home vs homeowners going through established builders or General Contractors. You become a risk to them; banks want to protect their investments. In case something happens and the bank needs to take over their rights on your building project they want to know what’s there is of good quality. The banks know that GC’s will not only allow shoddy work but are also familiar with each stage in the building process; no steps skipped over by being inexperienced. Just be prepared to have loan delays or the loan process in its entirety to not go smoothly or quickly. Next: Finding, getting, and picking estimates/subcontractors. With the DIY spirit trending, many homeowners looking to build their own home ask themselves this question, “Can I be my own General Contractor?” The following blog is the first part of a blog series that answers this question, gives advice on the next steps once you’ve decided, and what to expect along the way. What motivates homeowners to want to be their own general contractor? Most people are attracted to the cost savings, but other reasons are the satisfaction (and bragging rights) of building your own home and feeling like you are in control during each stage. Although most people want to be GC just for the cost savings, in the end, homeowners usually spend as much as if they hired one because of unforeseen issues. If you are one of the lucky few that actually saved money by being the general contractor, you have to factor in all the time you spent. If you want to be your own GC solely to save the 10-20% cost, it might not be a good idea. Remember time= money. A lot of people don’t realize how extensive the whole process is; it’s a full time job finding multiple, quality subs to give estimates on everything from the plumbing to the gutters. 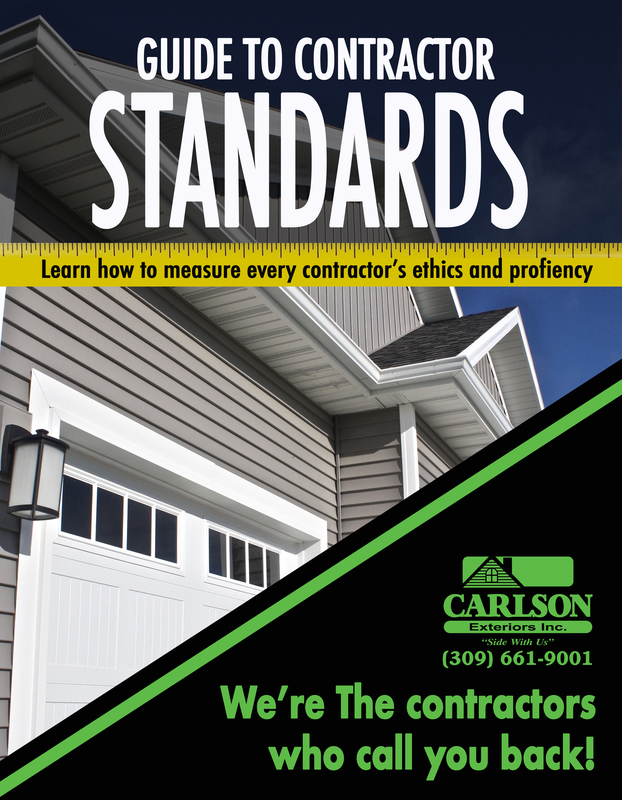 General Contractors who have been doing this for many years already know who they like to subcontract work out to and can often receive a quicker turn around on estimates than homeowners can; this is because GCs already have a standing relationship with these subs. General Contractors are also in charge of pulling all the permits and scheduling inspections. As a homeowner you might not be familiar with the “red tape hang-ups” or get pushed to the back of the line since others aren’t used to working with you. Don’t be offended, this is just part of being your own GC in the construction realm; people like to expedite who they already know can do the job successfully and punctually. It’s a good rule of thumb to not be a first time General Contractor if you have not orchestrated a smaller scale remodel. Completely restructuring a kitchen (moving plumbing, redoing cabinets, new lighting, etc.) is a good sample of what it ‘s like being a GC. You will get a taste of applying for permits, getting and picking estimates, scheduling your subcontractors, and the inspection process. Once you have done this, and are still eager to be your own GC, do it! If you feel overwhelmed and exhausted, hire a professional General Contractor. Part 2: Advice on being your own General Contractor.